Progressive spectacle lenses also called Progressive Addition Lenses (PAL) are corrective lenses used in eyeglasses to correct presbyopia and other disorders of accommodation. They are characterised by a gradient of increasing lens power, added to the wearer's correction for the other refractive errors. They give an uninterrupted vision through all the distance with enhancing cosmetic appearance. • The lens location of the correct addition power for the viewing distance usually only requires small adjustments to head position, since near vision tasks such as reading are usually low in the visual field and distant objects higher in the visual field. 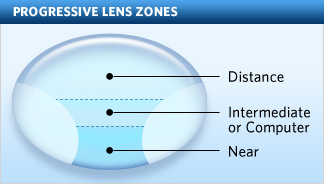 • Progressive addition lenses avoid the discontinuities (image-jumps) in the visual field created by the majority of bifocal and trifocal lenses and are more cosmetically attractive. 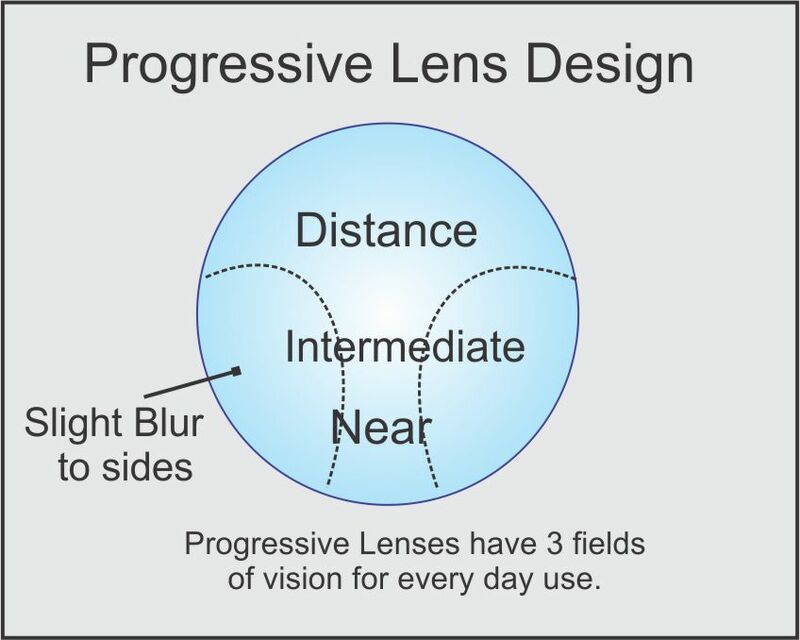 Since bifocal and related designs are associated with 'old age', proponents have suggested the lack of segments on the lens surface of a progressive lens appears more 'youthful' since the single vision lenses associated with younger wearers are free of segments or lines on the surface. • Progressive lenses can use the optimization principle, which is based on linearization and represents the lens surface using special spline functions. The lens’ power progressively increases between the high-power and low-power region of the lens. This specialized lens surface provides an accurate power distribution for both near and distant vision and reduces the number of optical aberrations. With many advantages, it has some disadvantages - peripheral distortion, need adaptation etc. To overcome all this fitting PALs needs an adequate and skilful person. With the advancement of new technologies and different lifestyle, demand of vision clarity and comfortibility has increased. Therefore, PALs provide basic hard design, soft design, advanced soft design and upto personalized design.